Visiting your physician shouldn’t be reason for concern about the risks of medical errors. However, medical negligence cases are shockingly common and cause traumatic injuries, permanent disability and can even lead to wrongful death. Patients in Pennsylvania and New Jersey need to consider the dangers of medical misconduct. A recent study conducted at Stanford University School of Medicine showed that, “the epidemic of physician burnout may be the source of even more medical errors than unsafe medical workplace conditions.” It is critical to remember that though uncommon medical malpractice happens every day. The medical malpractice and personal injury lawyers of Kamensky, Cohen, & Riechelson have been protecting the legal rights of patients since 1972. We have worked to gain a reputation for recovering full and fair compensation for injuries resulting from medical malpractice, nursing home abuse as well as defective medical products for our clients in Pennsylvania towns including Levittown, Northeast Philadelphia, Millbrook, Bensalem, Feasterville, and all of Bucks County. You can rely on our extensive experience to seek a successful verdict or settlement in your medical malpractice personal injury claim. Contact us online or call us in Pennsylvania at (215) 337-4915 or at our Trenton New Jersey offices at (609) 528-2596 today for a free and confidential consultation with a member of our experienced and skilled legal team. 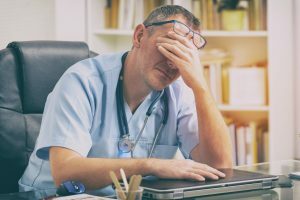 In many cases, physician burnout can produce higher rates of medical misconduct and mistakes, resulting in more instances of medical negligence. As an example, in medical work units where physicians self-reported a high level of burnout, medical error rates were as much as three times as high. Nearly 7,000 physicians were surveyed. Wrongful diagnosis: If a doctor makes an incorrect diagnosis, a patient can suffer serious injuries. If you or someone you know has suffered because of errors on the part of your hospital or physician it is recommended that you contact a skilled and experienced medical malpractice attorney as soon as possible. At Kamensky, Cohen & Riechelson, our medical malpractice and personal injury attorneys believe the law is a powerful tool that should be used to help give fair compensation to victims who have been injured due to negligence. We have dedicated the last 40+ years to ensuring that our clients recover not only their quality of life but what is rightfully theirs and helped to make their lives whole again. One of our highly knowledgeable attorneys is prepared to assist you with your accident claim. Contact us online, or by phone anytime at (215) 337-4915 anytime for a free, no-obligation consultation.